Job seekers looking for employment in the investment banking sector can visit the Citigroup careers portal, jobs.citi.com to find the complete list of Citigrpoup job positions. In this article, we will offer a complete guide to the Citigroup job application portal, as well as essential information about the employment opportunities and selection criteria, salaries, benefits, and the hiring process enforced by the investment banking company. To apply for Citigroup job openings, potential Citigroup employees must go to the online Citi careers portal, available at jobs.citi.com. They will have to fill out an official job application form on the portal to be considered for the positions they are aiming for. To do so, they will have to set up a personal account on the portal. Through the personal account, prospective candidates can also check their Citi application status. In this section of our article, we will provide job seekers with a step-by-step guide to filling out the online Citigroup careers application form. This is the first section of the Citigroup careers application form. 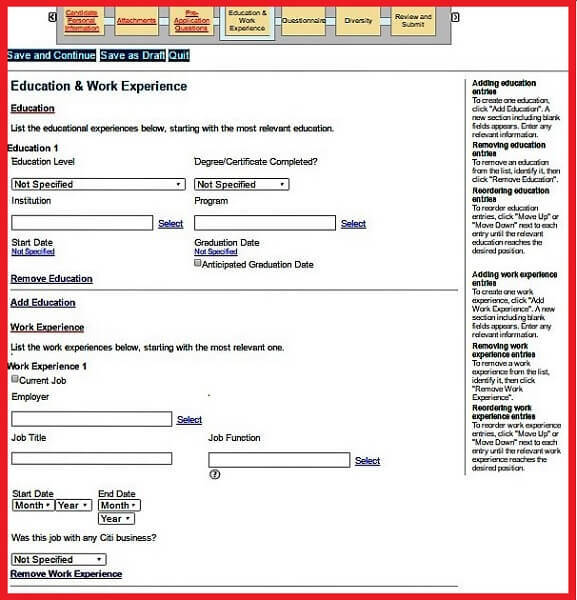 To complete it, job seekers may upload their resumes at this point to use the data-fill tool available on the portal. This will automatically extract information from their CVs and use it to fill out the relevant sections in the online form. 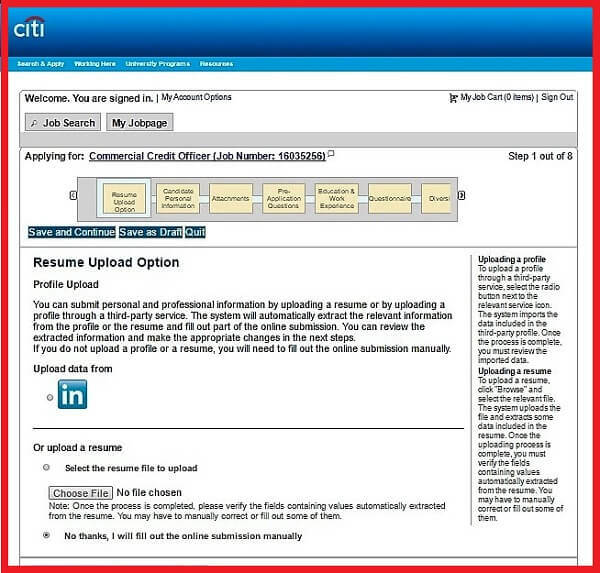 Candidates may upload their resumes to the Citigroup careers portal to use the data-fill tool. Also, candidates may use their LinkedIn profiles to provide the required information to use the tool. Please note that the data fill tool is optional. 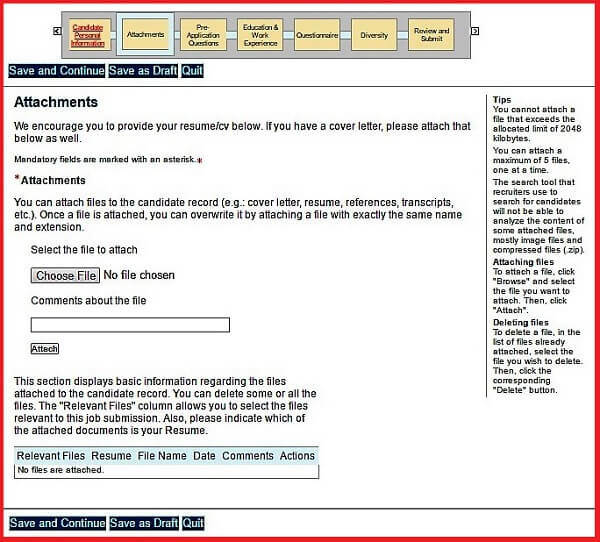 If candidates wish to attach their resumes and fill out their forms manually, they may upload the file for the Attachments section. 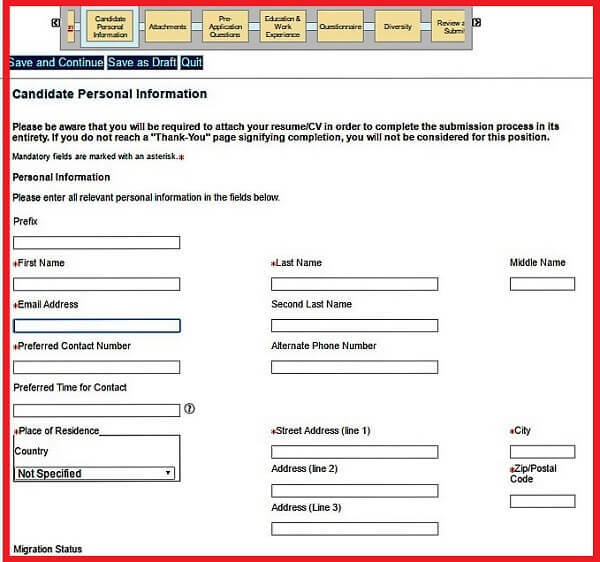 This section of the Citigroup application form requires candidates to provide their complete contact information. Then, the hiring specialists will use this information to contact them for the upcoming steps of the assessment process. Candidates must provide their complete contact details for this section of the Citigroup careers application. For the second part of this section, candidates must answer a short questionnaire regarding any referrals they may have. This also includes questions about their previous employment, and how they have learned about the position they are currently applying for. For this section of the Citigroup job application form, candidates may attach all the documents they deem relevant to the hiring process. As such, they can upload their resumes, cover letters, references, or diplomas. Please note that they are allowed to attach as many as five documents for this section within the upload limit. Applicants must attach their supporting documents for this section of the Citigroup careers portal. All candidates must attach at least one file to this section of the Citigroup job application form. This way, they can proceed to the following sections of the online employment application. This section of the Citigroup careers application form requires candidates to answer a short questionnaire regarding their ability to comply with the minimum employment age requirements. Also, they will have to certify that they are aware that they may be asked to submit to pre-employment drug tests. Candidates must answer the pre-application questions for this section of the Citigroup careers form. Then, they must certify that they are aware that the company may opt to conduct an employment and education background test. In addition, Citi may opt to perform a criminal record investigation, as part of the assessment process. As such, the pre-application questionnaire is mandatory. In fact, all candidates must complete it to proceed to the following sections of the form. 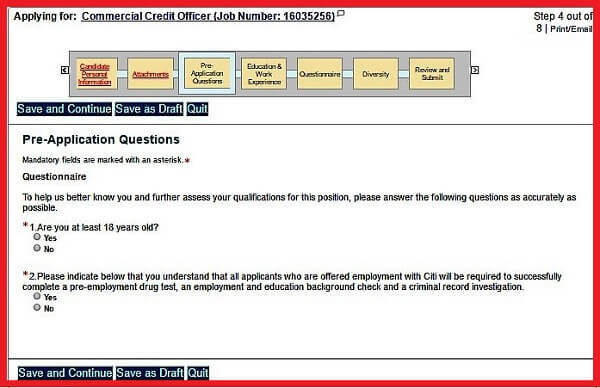 For this section of the Citigroup careers application form, candidates must provide information about their previous employment and education. As such, they are required to mention each of their relevant previous positions and education programs separately. Candidates may provide information about their professional and academic experience for this section of the Citigroup careers application. Moreover, if candidates have chosen to use the portal’s data-fill tool, this will fill out this section automatically with information from their resumes. Please note that this section is optional. 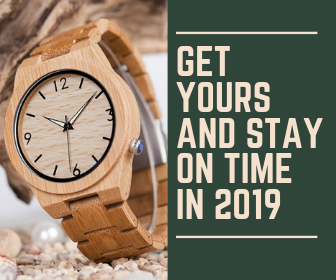 Candidates may opt to proceed to the following sections of the form without providing any information about their professional and academic experience. This section of the Citigroup careers application form is aimed to assess if the candidates applying for the open positions are able to comply with the company’s employment eligibility criteria. As such, it features questions about the candidates’ legal authorization status to work in the United States. 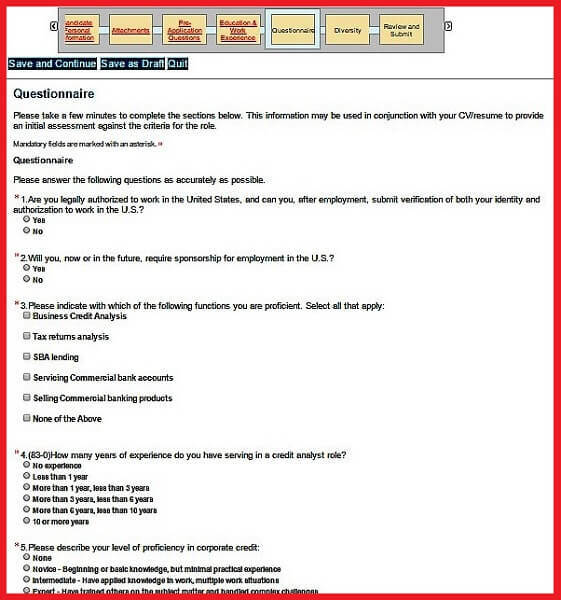 Candidates must answer employment specific questions for this section of the Citigroup careers form. Then, candidates can fill out the second part of the form. This is specific to each of the available Citigroup careers. As such, it features employment specific questions regarding the candidates’ relevant experience. Lastly, candidates must mention their salary expectations. Please note that all of the questions featured here are mandatory. 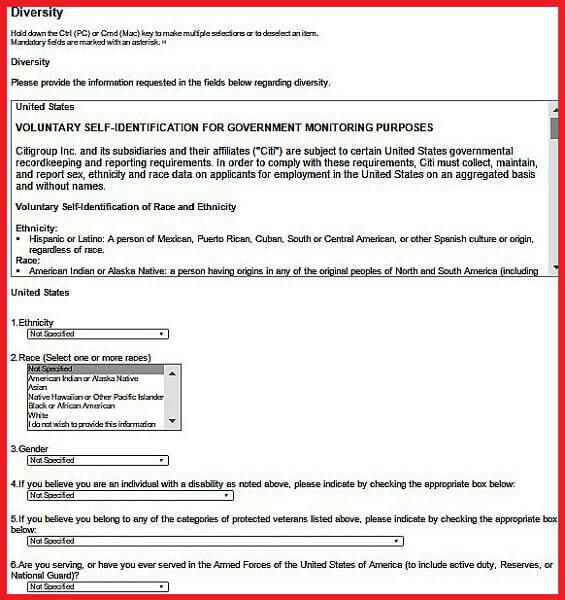 This section of the Citigroup careers application form features questions about the candidates’ race, gender, ethnicity, veteran status, and disability status. In fact, this section is part of the federally-mandated Equal Employment Opportunity questionnaire. Candidates may provide information about their race, gender, and ethnicity for this section of the Citigroup careers from. Please note that applicants must select one of the provided answers for each question in this section. However, they are not obligated to disclose any personal details that they do not wish to share with the hiring specialists. In fact, if they wish to keep some or all of the information required here private, they may select the “I don’t wish to answer” option. The information they provide for this section will not affect the outcome of their hiring process in any way. This is the final section of the Citigroup careers application. Candidates will be able to proofread their filled-out forms and edit out any spelling mistakes or data inaccuracies in them. Then, when they complete their review, they can submit their forms to the Human Resources department for assessment. Candidates for Citigroup employment must be 18 years old. Applicants must have legal authorization to work in the United States. Candidates must be able to provide proof of their identity and work authorization during the hiring process. Citigroup job listings are widely available online. However, the best source for employment opportunities at Citi remains the official Citi careers portal, jobs.citi.com. Job seekers can find the newest available positions there and submit their applications online. Young professionals interested in investment banking can apply for internship programs at Citigroup. They will get to work alongside the best-trained professionals in the business and earn some very important skills during the program. The final Citigroup salary for interns is determined during the interview process according to the professional and academic background of the applicants. As such, rates may vary between $9.00/hour and as much as $31.00/hour. The most reliable source for job listings for Citigroup’s management sector is the official careers portal. At the moment, there are over 4,300 available Citi careers in management that candidates can apply for. They will have to fill out their online application forms to be considered for the jobs they select. The company’s human resources specialists will conduct this review. They will analyze the online forms that the applicants have submitted. Also, they will determine whether or not they are suited for their chosen jobs. Then, the HR representatives will contact candidates by phone or e-mail to schedule job meetings. All candidates will meet with the Citigroup recruitment specialists, as well as the hiring managers of the department they are applying for. During the interview process, the company representatives aim to find the best-suited candidates for each of the open positions. The process for entry-level positions may only include one or two job meetings. However, candidates aiming for higher level Citi careers may have to participate in up to four interviews before the company representatives present them with the final answer. For each step of the Citi hiring process, candidates can check the status of their Citi application online, via the account their created on the Citi careers portal, jobs.citi.com. For the final section of our article, we will provide job seekers with a few sample interview questions used in previous Citigroup job meetings. They can use these to practice their interview answers as this will improve their performance at the meeting. Why have you applied at Citigroup? What do you know about Citigroup? What makes you qualified to meet the responsibilities of this Citigroup career? Could you please tell me about a time when you have had to manage a conflict as part of your job responsibilities? Could you please tell me about a time when you have had to deal with an irritated customer? How did you handle that situation? What are the main skills that make you qualified for this position? All job seekers aiming for a career in the investment banking sector are should explore the Citi careers portal. Their employment opportunities are some of the most attractive ones in the field. By following our step-by step guide, they can fill out strong online employment applications and make a good impression to the company’s recruitment specialists.